Before you start, you might want to enable the magnifier or return buttons to redirect to the results page. Please read this section on how to do that. 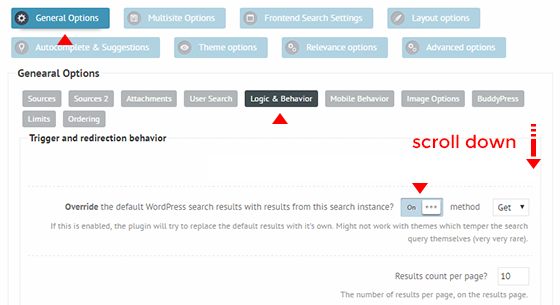 This option allows you to display the results from Ajax Search Pro instead of the default WordPress search results on the search results page. NOTICE: This option does not affect the layout nor the styling of the results page. Some information has to be sent when overriding, so the override handler knows which search instance is the override sent from, what options were selected etc.. and to store that information even when the user paginates through the results page. It's a matter of your preference, I recommend using the default Get method, as it does not rely on cookies at all. This should be set to the same as the number of results originally displayed on the results page! Most themes use the system option found on the General Options -> Reading submenu, which is 10 by default. If you set it differently, or your theme has a different option for that, then set this option to the same value as well.